The other side of the equation is the huge bias that the Indian consumer has to apps. Amazon is now installed on just over a quarter of all Android devices in India, which is more than twice US and UK levels. Here, too, Amazon has made good competitive strides against Flipkart. Amazon now sits with the same installed base as Flipkart. Why Flipkart is flirting with SnapDeal for a Merger ? Snapdeal is running out of options for survival, clamour about a possible merger between Flipkart and Snapdeal has gained ground. Snapdeal has a broader seller network and could provide Flipkart with greater reach, in addition to access to Snapdeal’s wider customer base. Also, the combined entity could possibly be in a better position to tackle the threat from Amazon. However, if Snapdeal is indeed busy falling apart, it is not clear that Snapdeal’s baggage would not outweigh its benefit to Flipkart. It might be better to just leave it be. Amongst fashion retailers, Jabong’s slide has slowed down since its acquisition by Flipkart, although both website traffic and app installs are still in decline. 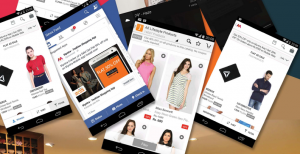 Traditionally, Jabong has been strong in desktop shopping while Myntra has been primarily app based. Myntra’s website traffic has rebounded nicely after the experiment with an app-only business model a year ago, but its app installed base has also declined a little over the last year. Interestingly, active app users on both Jabong and Myntra have been sliding down over the past year. For Myntra and Jabong, Flipkart has a target of 40-50% revenue growth in FY18 to reach ~US$2bn combined revenues. Given Amazon’s increasing focus on the high-margin fashion segment, it will be interesting to see how Flipkart’s dominance in online fashion retailing through Myntra and Jabong evolves.